Andrew also worked incredibly hard to get to this year’s Chef Stagiaire Final; first coming over for a week to do his Phase 2 stage at Lords of the Manor with Executive head Chef Richard Edwards and his team, where Richard offered him a position in the brigade! Then coming back for the Final Phase week at Dinner by Heston Blumenthal with Executive Chef Ashley Palmer-Watts and his 2 Michelin star, Dinner team. Since leaving school Andrew has completed his NVQ up to Level 3 at South West College, at both the Dungannon and Enniskillen campus’. Andrew has worked his way up through the ranks and is now thoroughly enjoying being responsible for the Loughside Bar & Grill at The Lough Erne Resort, Enniskillen, under the guidance and mentorship of Executive Head Chef, Noel McMeel. We wish Andrew the best with his career and will keep an eye out for news of further achievements in the near future. Louise left school in 2010 to pursue an NVQ Level 1 in Professional Cookery at her local Catering College in Romford, Essex. On completion of the course, Louise joined the Springboard Summer School Program where she spent 2 informative and interesting weeks at the 5* luxury Hyatt Regency Churchill Hotel in Marble Arch. Following that Louise was lucky enough to be accepted onto an Apprenticeship scheme with Lexington Catering, where her first assignment was at the University of West London. Lexington encourage their Apprentices to work through multiple client sites to enable them to learn a wide variety of techniques and styles, ensuring they get a complete formal catering education, setting them up for the future in the best way possible. As such Louise worked at clients such as Coca Cola Head Office, Mann Group and Knight Frank, Baker Street, among others. Louise continues to thoroughly enjoy her job at Lexington, having served for 4 years now. Louise was proud to complete her apprenticeship last year and is now regarded as a fully-fledged and dedicated member of the Lexington team. As well as being an enthusiastic and lively member of her Lexington team at work, Louise also finds time to help her Mother and Brother care for her Grandmother, who has Alzheimer’s, in her home town of Romford, Essex. We wish Louise all the very best for her career and hope she thoroughly enjoys her prize trip to work with Head Chef Claude le-Tohic of 3 Michelin star Joel Robuchon, MGM Grand, Las Vegas and then onto the amazing Six Senses Zighy Bay in Oman to work under Executive Head Chef Richard Lee and his team. Incredibly well done Louise. Thank you for your hard work. This years Finalists are Andrew Leonard from the Lough Erne Resort in Northern Ireland and Louise Roberts from Lexington Catering, London. 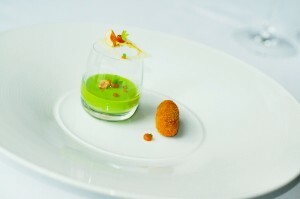 The Final will be held at Dinner by Heston Blumenthal within the Mandarin Oriental Hotel in Central London. Executive Chef of the Fat Duck Group, Ashley Palmer-Watts, will be on hand to judge the Finalists entries and offer advice and suggestions on their cooking and presentation. As well as this, the 2 Finalists will be working for 5 days in the award winning 2 Michelin star kitchen, among other accolades, voted #7 in the San Pellegrino Worlds 50 Best Restaurants. Getting the opportunity to work at Alyn Williams was an absolute privilege. The first thing when I arrived that took my focus was the setting, set in the heart of Mayfair in the Westbury Hotel, Alyn Williams restaurant, I couldn’t wait to dive in. The first day, every chef, from the minute I walked in made me feel welcome. I spent most of my time on the larder section on day 1 where I learnt a lot of new ingredients and ways to prepare them and cook them. The chefs on the section where kind and helpful to my experience here which made it even more enjoyable and informative. 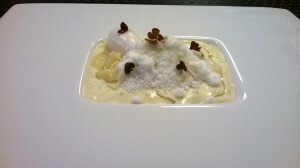 My personal favourite element and dish was the aerated foe grois, blew me away on presentation and skill. What made this interesting for me, I had never heard of the idea of aerated foe grois, served chilled from the freezer. It was served with pickled beetroot, pistachios and brioche. The pickled beetroots were cooked in their own juices to really enhance that main flavour. It was prepared very differently to what I have seen before. They use a special machine that turns the beetroot while slicing, so it comes out in perfect ribbons. Never seeing that before interested me. The brioche was a little rectangular finger, then it had a small parisienne scoop taken out the top of them. Then once charred on every side on the grill the holes where filled with a delicious sour cherry puree. It was gorgeous!! My favourite dish by far. When it came to the service Alyn Williams allowed me to have my own tasting menu. I tried every dish they had on the tasting menu which was really kind of everyone to prepare this for me. The dishes where sensational, and what really caught my attention was the amount of elements on each dish. Each dish consisted of at least five to six elements that combined together where delicious. I would say my second favourite dish had to be the pigeon, just on the style and the amount of elements on one plate, it astounded me. It was roasted pigeon, with white asparagus charred on the grill, poached onion shells filled with a curry mayonnaise and cucumber. That dish was amazing!! The other main course was lamb nicoise. Coming from a classical kitchen in my earlier years, dishes like that really interest me and you can never go wrong with the classical combinations in my opinion. On my second day I again spent most of my time on larder, doing mise en place throughout the day. Whatever job was thrown my way I took on, but as most of the jobs I had done before there were some jobs that I had never seen before and wrote down for future interest. That is what I found good about the week, there was quite a lot of methods and ingredients that I had never come across before but that was the main point of the week, to see what a Michelin kitchen was like and to learn about different produce. Day three was different. I spent time on larder but also helping out on the vegetable section which for me was quite familiar as that is the section I work on at Colette’s. Also watching over the fish meat and sauce section. That really interested me because I have never been on that section before so to ask questions and be explained how to cook meat and fish blew me away. Obviously every kitchen has different methods on cooking meat and fish and how to hold meat once cooked, but to give some information on how the restaurant I work at does it and compare it to how they do it interested me and some of the chefs that worked there to. I loved to watch Alyn Williams at the pass, watching how he ran service and plating up. I was watching a master at work. Day four consisted of me working on pastry. Learning about the breads, deserts and the canapés which come from the bread section. See as you go from kitchen to kitchen you see different ways of kitchen set up. The restaurant I work at has the bread sent from pastry and the canapés has a separate section. Alyn Williams had four different breads when I was there which amazed me. Everyone different and unique in their own way. The deserts blew me away, every desert was originated from a classical dish but had Alyn’s twist on it. My favourite had to be the strawberry pavlova with anise hyssop, the flavours where sensational and also never hearing of anise hyssop before opened my eyes to a new ingredient. It was a real aniseed taste like fennel or star anise, really strong on the palate. The dish was on the tasting menu and watching the production of all the elements on the dish amazed me. I think being on the pastry through the last couple of days interested me the most as I have never even touched pastry in any restaurant I have worked at. I have done simple classical deserts at college but not the level of quality like here. Alyn allowed me to try the deserts, this really engaged me into the flavours and how every element on the dish combined with each other and looked stunning. The last day was, to me, the best day, definitely. Not because it was my last day but the day that the most happened in my eyes. Saturday I had to cook for Alyn Williams and his Sous Chef. 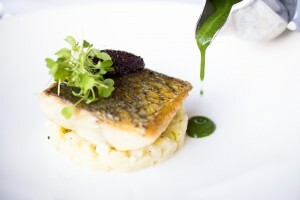 I prepared a fennel gazpacho for the amuse bouche and then my poached cod with spring vegetables for main course. Alyn and the Sous Chef tried them. Personally for myself I wasn’t 100% happy with what I produced but in the end it came out very close to how I wanted it. It was really helpful getting feedback from Alyn because he didn’t just focus on the good things he gave me some really constructive criticism which in my eyes really helped me and I took a lot away from it. Obviously getting feedback from a chef like Alyn Williams you’re going to take every bit of feedback and improve on them later in life will hopefully help me. I never thought in years that I would have the opportunity to have a Michelin Starred chef such as Alyn Williams try my food so I am so grateful to Chef Stagiaire Award for giving me that opportunity. To end a great day during service I was asked to help out in service, including plating up one of the star dishes on the 3rd course of the tasting menu, the foe grois. I really got into it as the Saturday night service was a lot more hands on because of the volume of covers we were serving. I really got on with every single chef in that kitchen, all of them made me feel like part of the team. Alyn made it a terrific experience for me and one I will never, ever forget!!! Alyn Williams’s tasting menu literally blew me away from start to finish. This is what I tried. Through the week i got to prepare and learn every element and method in creating these dishes. I arrived at the Restaurant at 8.30am. It wasn’t the easiest place to find and it took some searching for but when I arrived I found it to be a stunning setting off the beaten track in Oxfordshire. I entered by the front door so it gave me a chance to see the dining room. It has the relaxed feel of a pub with its casual seating and furniture but still has quality in abundance and the required contemporary touches, for example tables are laid with solid silver cutlery. I met the team that I would be working with for the day. Antony, the Head Chef wasn’t working that day so I would be spending the day with the sous chef Trystan, Junior sous Sam and Chef de Partie Theo. Trystan gave me a tour around the kitchen and then showed me where to get changed. To start the day I was working with Theo on the larder section. 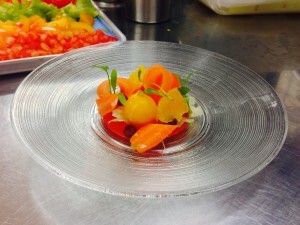 He had me preparing the heirloom tomatoes to confit, crispy frying vegetables for garnishes on the mains such as artichokes, aubergine and shallot; he also had me cutting julienne kohlrabi for the crab starter. The atmosphere in the kitchen was really relaxed. The guys were having a laugh and were very welcoming towards me and made me feel right at home. My first impressions of the kitchen were that it was a very well used kitchen and that the team were doing very well with the equipment that they had available to them. For service I was on the pass with Trystan, watching the brigade work and tasting the components of a full dish on one spoonful. One of the desserts I tried was salted caramel, chocolate and peanut terrine, olive oil fluid gel and lime ice cream. The way the components of the dish were put together were very clever. The bitter and salty chocolate terrine was made more smooth and palatable by the olive oil fluid gel; then the palate was cleansed by the sharp citrus of the lime ice cream. Delicious! It wasn’t really busy on this day which was good in a way as I was able to really quiz the chefs on what they were doing and they willingly gave me time and help in order to understand what they were doing. It was a good first day, the start to a great week. Day 2 of my stage at the Napier I arrived at 8.30am. Today I met the Head Chef, Antony Skeats, a very nice guy from the North West who quizzed me a lot about where I work, what I do there, the sort of food we serve, hours we do etc. I was then set to work and put onto the sauce section with Sam the Junior Sous Chef. I started by making a mushroom ketchup for a rib of beef dish they serve for 2. They have a few different flavoured ketchups with a technique and product I’ve never seen before by making a fluid gel which is just like a thickened liquid from either fruit of vegetable; the product they use to do this is Gellan F. This I found really interesting and it is something that I will take back to my place of work. I then prepared the mire poix for stocks and together with Sam made 3 sauces, the iberico pork sauce, lamb sauce and bouillabaisse sauce. All 3 sauces were packed with so much flavour but the one that really stood out the most for me was the bouillabaisse. It was cooked very quickly, simmered for a timed 1 hour, then rapidly reduced until it was really concentrated, taken off the heat and left to cool. It was then emulsified with olive oil with an immersion blender like a mayonnaise, something I’d never seen before. It was thinned down with a little cream and seasoned with salt, Pernod and lemon. I then made the fresh gnocchi for the cod dish which I had only made it once before so it was good for me to be able to practice this classic technique. For service I was on the pass again but with Antony this time. Whilst there only 10 booked things got busy and we ended up doing 30 covers. I helped with the plating of the dishes when it was busy; the brigade were much focused and the service ran like clockwork. On Day 3, I worked on all stations around the kitchen on this day doing a variety of jobs for all sections such as making a herb oil using olive oil, hard herbs such as Thyme, Rosemary, Garlic and Bay Leaves which were gently warmed on the side of the stove then taken off the heat left to cool then the herbs passed out. Hispi cabbage for the iberico pork dish was cooked with this herb oil. It was cooked sous vide 85 degrees for 25 minutes; the herb oil gave the cabbage a real depth of flavour. Something else I did which I found very interesting was that on a service when cooking meat and fish. They don’t finish their meat or fish with butter taking it to beurre noisette stage and basting, instead they make a big batch of beurre noisette and when finishing their meat or fish they have a finishing brush and brush it with this butter which gives you a more consistent product and saves lots of money on butter; this I also thought would be very useful! One thing I found when working here and admired, was the way the chefs were very quick, very focused and meticulous on a morning getting the prep done. On service I was on the larder section, cooking and dressing plates. I was in charge of the pigeon dish and chargrilling the asparagus for the asparagus starter; both dishes proved to be very popular. Looking around when it was busy I noticed that the team still paid great attention to detail and the high level of concentration and consistency shown by the chefs was a great thing to see. My final day at the Napier I started by helping out on the meat and fish preparation. On this day it was explained to me by the chefs that most of the meat and fish for the weekend arrives today, and lots came in!!!! From live crabs and lobsters to Iberico pork loins, beef fore ribs sides of hake, cod and diver caught scallops. I learnt a new technique, cooking lobsters sous vide in a water bath, and the way they prepare their sides of fish by skinning heavily salting, rinsing and rolling in cling film really tight and vacuum packing so the shape is perfect, something I also had never seen done before. Throughout the week I have seen absolutely stunning produce, from meat and fish through to vegetable and fruit. For example the fruit and vegetable supplier brought some raspberries that he grows himself on his farm and they were hands down the best I’ve ever tasted!! It was clear to me that it’s not just the skill of the chef and the techniques used but it’s also about sourcing the best produce no matter the cost. 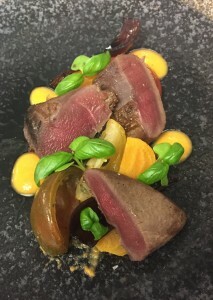 I had a fantastic week at the Sir Charles Napier it was great to experience a different restaurant style to what I am used to. I’m very grateful to Antony Skeats and his team for finding time to explain things to me and making me feel at home in their kitchen. They made me feel so much at home that I was offered work with them on a permanent basis which flattered me and I’m seriously considering. Amazing experience – thoroughly enjoyed my week. My first day in the kitchen. I arrived 15 minutes early & met Slawek the larder/pastry chef, once Adam the Jnr Sous chef arrived, he put me to work with Slawek. I helped set the section for lunch, my first job being the ‘Canapés’, a Feuille de brick cone, baked for 20 minutes, placed in a bowl of mixed peppercorns to stand it upright, filled with a layer of pea espuma, lemon cottage cheese, another layer of pea espuma, a fresh pea & to finish a sprig of pea cress, the opinion of the kitchen was that it resembled an ice cream cone. My next job was to set the ‘Amuse Bouche’, I had to horizontally halve cherry tomatoes so the seeds were on display, sea them & semi-dry them in the oven at 80oc, then I had to take 3 of each heritage tomato & cut them differently; into wedges, slices & concasse, arranging them of a tray lined with a j-cloth. To finish setting up for service, I picked & cut chervil, parsley, dill & chives; unwrapped & checked the service fridges & cleaned the surfaces, larder pass & the kitchen to restaurant window. Service was quite quiet, but that being said it was only a Tuesday, I was in charge of the canapés & the amuse bouche, which every table have. In the order that they have canapés upon sitting, bread upon ordering, amuse bouche next, & then depending on the menu they have ordered, (‘Fixed Price’, ‘A La Carte’, ‘Taste of Alimentum’ or ‘Chefs Tasting’) they have their next course. After service as every day, we cleaned down, scrubbed the floor, checked for mis en place & then if time went on breaks, to be back at 5:00pm for staff food or 5:30pm for service. Before leaving I made a couple of the lobster savarins for the ‘Lobster A La Carte’ lining a savarin mould with cooked spaghetti, then piping a mixture of chicken mousse, diced lobster meat, chervil & reduced lobster sauce. Each day a member of staff is nominated to do staff food, so if there was a chance to go on a break in the afternoon, we were told to be back by 5pm for staff dinner or 5:30pm for service. The ‘Quail A La Carte’, a dish comprising of 5 dots of broccoli puree, 5 dots of peanut & lime puree, crushed peanuts, toasted & puffed wild rice, 2 pieces of charred broccoli (1 piece for tasting menu), 2 quail breasts & legs (1 of each for tasting menu), steamed bok choi, lime zest & quail jus. The ‘Lobster A La Carte’, a dish comprising of the savarin of lobster, steamed for 4 minutes, with a salad of sliced mixed chicory, frisee, 11/2 orange segments, chive batons, chervil & orange dressing place in the middle, with lobster pieces & lobster sauce around the edge. The ‘Salmon A La Carte’, a dish comprising of a zig zag & 4 dots of grapefruit semi-gel, 1 spoon of each salmon dice, dill, lemon juice & rapeseed oil, pressed into a square mould on the plate, pickled radish segments, mixed freshly sliced radishes, fennel cress & to finish horseradish granite. The ‘Eel A La Carte’ & ‘Wild Mushroom Fixed Price’ broths, the first a bowl filled with freshly diced apple, 2 pieces of confit chicken wing & onion warmed under the salamander (1 of each for tasting menu), 2 pieces of Eel sealed on the planche (1 of each for tasting menu), & burnt onion & eel broth in a side dish for the customer to pour over themselves. The second dish is a bowl with sautéed pancetta dice, wild mushrooms & pearl barley, finished with chives, moulded in a 45mm round ring, with parsley puree squeezed on top, & a side dish of burnt onion & pancetta broth for the customer for pour over themselves. The ‘Asparagus A La Carte’ a dish comprising of, a ‘G’ shape line of watercress puree, 5 asparagus spears cooked in asparagus juice for 2 minutes, a fried duck egg, seasoned with freshly ground black pepper cut with a 65mm ring, wild garlic, pickled morels & finished with morel dust. After service we deep cleaned the kitchen, taking the planche’s back to new, & scrubbed & mopped the floor. My second day in the kitchen, again I was with Slawek on Larder, I went through most of my jobs that I had done the day before, helping set the section for service. I prepared asparagus, feuille de brick cones, crumbling feta, cutting heritage tomatoes and other jobs, sadly there wasn’t a great deal to do as it was a slow start to the week, but that so, it gave me more of a chance to get involved in service and see and experience more. After service we cleaned down, and me and another stage, ‘Mikey’ went off to grab a coffee in the centre of Cambridge. The evening service wasn’t particularly busy but it was admirable that even on the slightly more quiet services, the team didn’t switch off or lose focus, and maintained their high standards. On my third day I got to meet Richard, the senior sous chef, he was covering the saucier section for the day. I got to help him with his mis en place starting with making a small batch of chicken mousse; it is used in the kitchen for the lobster savarins on Larder and the wild garlic & pigeon boudin on Saucier. Whilst the mousse chilled in the fridge, Richard got me to help him tie the ballotines to shape Rump Cap he had trimmed & portioned. Once they were tied, the were vacuum packed, 9 to a bag, leaving space between them for heat to circulate, and water bathed at 49oc for 5 hours, this allows the enzymes in the meat to break itself down and in essence only cook the meat to rare, but tenderise it. Next I picked down the pigeon and prepared a chiffonade of wild garlic for the Boudin, mixed it all with half the mousse I made earlier, cooked off a small amount, and checked the seasoning and once it was correct I had to pipe and roll ballotines the size of a 1p coin and tie them ready to be cooked. My next job was to dice lobster tail and claw meat for the saucier and larder section, it is mixed through the lobster sauce a la minute or mixed through the lobster savarins. In the afternoon after service Richard went through my order with me for the ingredients that I need to prepare my dish for him & Mark the next day, & what pieces of equipment I could use in case they were different to what I had to use used in my original mock up. For the evening service we had around 20 covers booked and Richard said that I would do the sauce section and that he would oversee me. So in every time a check came on order he would talk me through it and sometimes show me. Lamb, water bath 62oc 20mins, rest. I feel that service went well, and that Richard liked the way that I cooked and conducted myself. Friday, and we were preparing our mis en place for the changes to the chefs tasting, as well as me preparing my dish for Mark and Richard. 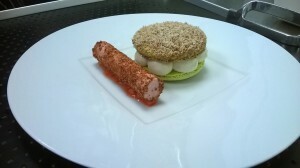 For the new menu I prepared the goat’s cheese mousse with fennel jelly and the raspberry jelly savarins and chicken mousse again for the a la carte. My ingredients for my competition entry arrived, and I got most of my prep done by lunchtime leaving a few little jobs that would be best done closer to the time, such as smoking the mussels and picking the micro herbs and cooking the sole and crab. Lunch was pretty busy compared to the previous days, so I just tried to help out wherever I could. After lunch we cleaned down and I weighed out the bread for the pastry section, then I finished preparations for my dish. I paned my crab discs and deep fried them then unmoulded my tomato consommé jelly and sat it on top of the hot disc, the jelly is set with agar agar so it will not melt below a temperature of roughly 800c. 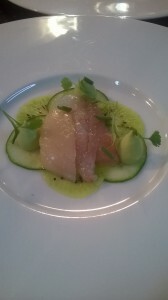 I finished it with a dot of avocado puree and micro coriander and basil and sat it on a swipe of the avocado puree. Before eating, Richard asked me to explain the amuse bouche. I explained that I wanted it to be cleansing and refreshing as a mimic of a tomato, crab and avocado salad, with different textures and temperatures adding different dimensions to the dish. 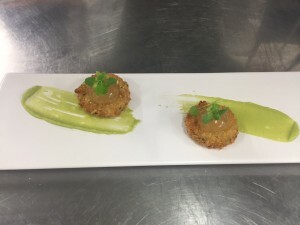 Upon trying it we all agreed it was very nice, I initially said I felt the tomato was lost in the amalgamation of the flavours but Richard stated and was right in saying that the tomato lingers afterwards and that actually he would have liked to have had more of the avocado puree. Adam felt that even though coriander was present in three of the elements it wasn’t overpowering but subtle and flattering. For the next dish I started by water bathing my sole ballotine and cauliflower puree for 15 minutes at 620c. Whilst these were cooking and warming up respectively I started to cook my sea herbs, cauliflower leaf and smoked mussels in an emulsion of the smoking cooking liquor from the mussels, with butter. When everything was ready I drained my herbs and ballotine on a tray with a j-cloth and began to plate, placing dots and a swipe using a pastry comb of cauliflower puree. I then created a bed of the sea herbs and mussels and laid the ballotine on top and sprinkled it with browned milk powder crumb. Again Richard asked me to explain the dish to which I said it was a mimic of a sole meuniere as the sole was sous vide in beurre noisette and finished with toasted milk powder. The garnish was meant to be a taste of the sea. We tried it and Richard complimented it saying the fish was cooked perfectly, Adam added he liked the use of the cauliflower leaves. But they both agreed in criticism that the fish lacked seasoning, to which quite embarrassingly I admitted that in rushing to plate, before sprinkling the milk crumb I was supposed to season it with the citrus salt I had prepared earlier. We then tried it with the citrus salt and the dish was then without criticism. I was very happy with the results and went into dinner with a beaming smile on my face! Today was sadly my last day and I had to be up early to check out of the bed and breakfast, but also I was excited to get to work. I was put to work with Steven on the garnish section and my first job was to cut celeriac fondants, next I had to peel potatoes for the fine noodle that they wrap pigeon and wild garlic boudin with. Steven got me to help with his mis en place by vac packing a lot of his prep and set up for service. I then prepared asparagus, and truffle shavings which I laid on a tray wrapped in Clingfilm, rubbed them with truffle oil and wrapped them. For lunch I carried on with little prep jobs staying out of the way but managing to keep an eye on the service. Mark Poynton came in the kitchen and actually offered me a job, to which I was flattered but had to decline because I have put in motion plans to move to London with my girlfriend. I am truly disappointed that I could not accept this fantastic offer. We didn’t really stop that afternoon as there were plenty of jobs to do around the kitchen and lots of cleaning. In the evening it was very busy, but service went smoothly and to the same high standards as throughout the week. I was carving the meat on the pass throughout the night for Richard and passing him the puree’s and sauce’s relevant to the dishes that he was plating or warming the plates relevant to the dishes we were away on. Towards the end of the night Richard said as a thank you for my hard work throughout the week, I could choose a starter, main & desert off of any of the menus. Wild Mushroom off of the fixed price, a broth of pancetta and onion, served with wild mushrooms, pancetta, pearl barley and parsley. It was delicious, moreish – yet enough, as anymore and you would want to eat it all day and would never make it to your main course. Next I had the Cauliflower A La Carte, a dish with roasted, blanched, caramelised, shaved and pickled cauliflower, finished with pom molasses, nasturtium, pomegranate seeds and grated 97% chocolate. I was asked why I ordered this and I answered that I was simply intrigued by how it would all taste together and that I had to try it. 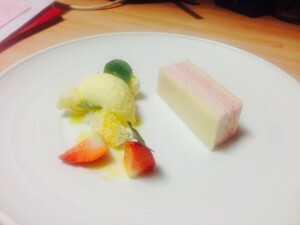 My final dish that I chose was the Strawberry A La Carte, a dish with a strawberry and white chocolate marquise, white chocolate aero, (which I learnt how to make), chopped fresh strawberries, blue nasturtium & white chocolate & rapeseed oil ice cream. It was a delicious & light dish, the sweetness of the white chocolate balanced out with the bitterness of the rapeseed oil. Upon finishing my week at Alimentum, I had a beer with Richard, we wished each other the best & I left feeling that I had had a great week, learning a lot and thoroughly enjoying myself, given the chance again given different circumstances I would happily work at Alimentum with Mark, Richard & the team.